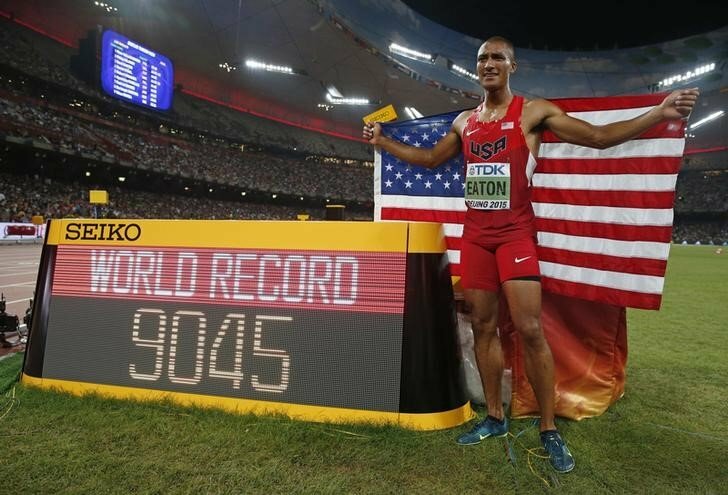 MONACO (Reuters) – American decathlete Ashton Eaton was named the IAAF’s male athlete of the year for 2015 on Thursday after breaking the world record to win the world title. Eaton, 27, scored 9,045 points in Shanghai in his first decathlon for two years to beat his own world best mark. “Athletes spend the most vigorous years of human life, arguably called the ‘best years’, working to hone their abilities,” he said in a statement. Eaton won the award ahead of Jamaican sprinter Usain Bolt, who landed his 11th world championship gold medal this year, and American triple jumper Christian Taylor. “I did not beat Usain and Christian, my work simply differed in design. They are some of the most talented and beautiful performers of all time. I’m flattered to be among them,” Eaton said. Genzebe Dibaba of Ethiopia won the female award after breaking the 1500 metres world record in July in Monaco with a time of three minutes 50.07 seconds. She captured the 1500 world title in Beijing and took the bronze medal in the 5,000. The awards are usually handed out at the annual gala dinner in Monaco but that was cancelled this year due to doping issues in the sport. “While the athletics family is not gathering together as usual in Monaco, we rightly celebrate the marvellous 2015 achievements of the athletes,” IAAF president Sebastian Coe said.